Sombre, conflicted, and impactful. ‘Aftermath’ at Tate Britain reveals the conflicting efforts to control popular understanding of the First World War. As we approach the 100-year anniversary of its conclusion, AML’s latest intern Josh Berg went to make sense of this post-war conflict. The first room, ‘Remembrance: Battlefields and Ruins’, immediately reveals the contrasting narratives different groups attempted to construct in the War’s aftermath. Mainstream depictions, led by government-commissioned works, highlight the heroism of front-line soldiers. The characters display unwavering perseverance in their work despite the brutal conditions and destruction surrounding them. Alternative perspectives offered a stark contrast to the lionhearted official account of the Great War. This viewpoint was epitomised by thoughtless suffering, wasted lives and widespread post-war neglect of supposed veteran heroes. The key sources of this alternative approach were often former soldiers or official government-commissioned artists who, having seen the horrors on the front line, refused to produce works that supported or glorified such excessive destruction. Instead these artists used their creativity to support post-war political revolutions. Something that is still being done to this day. Left, William Roberts bold depiction of heroic soldiers on the front line epitomises government commissioned works. Right, C.R.W Nevinson’s ‘Paths of Glory’, which was banned by the military censor, typifies works that sought to present the War as a campaign of needless suffering. As the War approached its conclusion, governments across Europe sent more and more official artists to the front lines. They took this chance to shape public representations of the War. It’s something that is now becoming increasingly difficult, as social media and 24/7 news coverage have taken this power away from governments, giving ordinary people a bigger voice. Back in 1918, governments relied on war artists to paint returning soldiers as heroes. The patriotism and mourning encouraged by these paintings prompted public remembrance ceremonies. National unity was promoted in the face of potentially disruptive loss. Left, Gromaire’s ‘La guerre’ depicts three soldiers who appear to be dressed in steel, highlighting the superhuman strength and perseverance of soldiers on the front line. Right, Salisbury’s ‘The Passing of the Unknown Warrior’, shows the first Remembrance Day after the construction of the Cenotaph at Whitehall. Over 500,000 people visited the memorial in the first week it was unveiled. Despite the heroic status bestowed upon soldiers by government-ordered artworks, the reality for many on their return from the front was far from the hero’s welcome that would have been expected. Instead many veterans were marginalised, neglected and mistreated in the aftermath of the War. Among the returning British soldiers, over two million sustained some form of permanent disability, as well as the untold psychological trauma caused by the horrors of war. Contemporary charities such as Help for Heroes look to tackle the social challenges returning veterans face. However, in 1918 many veterans were left jobless. Neglected by the governments and societies who had painted them as rugged heroes, many veterans had no option but to beg on the street. Left, Grosz’s ‘Grey Day’ sheds lights on the neglect many veterans received upon their return. Right, Dix tries to show the horrific reality of the soldiers’ daily life in the War with this print ‘Mealtime in the Trench’. It is unsurprising that the government-backed visual representations, showing bravery and the heroism of those who were lost, still dominate contemporary understandings of World War One. This mainstream approach helped foster national unity in times of extreme loss. It also promoted a fitting respect for the huge sacrifice millions made for their countries. But this ignored some of the greatest horrors and most harmful effects that the heroes of the War had suffered. In recent times, whistle-blowers such as Wikileaks and Edward Snowden, have opposed government portrayals of conflict. In 1918 this was up to rebellious war artists and soldiers. ‘Aftermath’ exhibits both official and unofficial perspectives, highlighting the unifying and dividing effects of the War. 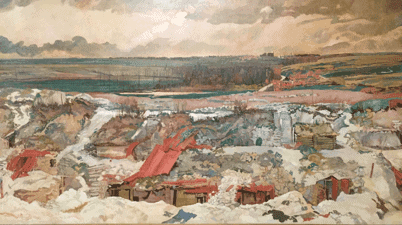 Charles Sims ‘The Old German Front Line, Arras, 1916’.